The Angels Die tells the story of Turambo, an Algerian peasant named after the village of his birth that was swept away by a storm. The novel opens with the threat of Turambo’s execution. What has he done? What has brought him to this point? Turambo tells us. His story is an interesting and compelling one that roams through poverty, racism and colonialism, religion, romance and naivety. Somehow Turambo never takes the turn you expect, his life following twists that defy a journey into heroism – as he becomes a boxer, the nation’s champion no less, you could argue that the story ducks and weaves in a fight full of drama and unexpected recoveries. Whilst this failure to play the hero should avoid sentimentalism, especially as the novel boldly faces prejudice, somehow it doesn’t. The message from Turambo’s story seems to be that what matters in life is not money or fame but the people you have around you, your family. And though money may buy you a certain privilege, your social standing doesn’t really change – Turambo will always be considered a stupid dirty Arab. Though this message rings true, there were parts of Turambo’s life that passed too quickly to allow a reader to see his journey from romanticism to home grown philosopher. And when we return to Turambo’s execution the plot twists again and years pass in paragraphs offering a wisdom that still feels unearned to me. The descriptions of Algeria and of the politics are fascinating, and the reader gleans more than Turambo himself, but ultimately I wasn’t moved by this story though I’m sure many will be. 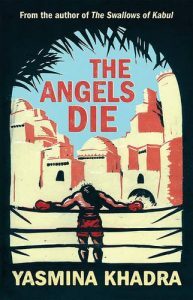 In The Angels Die Khadra paints a picture of a bygone Algeria lost in the dust of colonial memory. If you love romance with political undertones, this is probably the novel for you. Next week I’m reading a travel book, The Desert and the Sown by Gertrude Bell.